The QVEA monthly meetings are scheduled for the LAST Tuesday of the month. Meeting location is at the Colchester Town Hall. The Regular Member Meeting begins at 7:00PM. Consult the News section of the QVEA web site, or subscribe to the RSS feed for last minute schedule changes. The QVEA organizes three shows at the Zagray Farm each year in May, July and October. Displays of working machinery, restored (and some rough) tractors and implements, parts vendors for DIY restorations and the ever popular auction are among the many attractions. Also, there are seasonal activities (plowing in spring, harvesting in autumn as examples). Come to more than once each year and see something different each time! 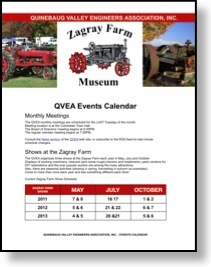 Click on link or icon for Mac iCal QVEA - Zagray Farm Calendar. This is a perpetual (almost) calendar Zagray Farm Shows and QVEA meetings. Will import into newer Microsoft Outlook versions (Outlook 2003 and later I'm told). We're working on a native MS Outlook .vcs file also.